Always striving to make it "Like it never even happened." One of the ways that we here at SERVPRO of Woodbridge/Lorton strive to offer the best service to our customers is through our equipment. John and his team work to maintain, continually update, and replace equipment that is worn out or aging. I would like to take a minute and tell you about one of the pieces of equipment that we feel gets overlooked for its greatness -- air scrubbers. Unlike a dehumidifier or an air mover— whose names are also their function— the air scrubber is more industry specific and we would love to share a little bit about what we use it for. In many loss situations, whether it be water, fire, or mold damages, there are contaminants left behind in the air. While our technicians are working to remove and restore the damage on material pieces of a home or business, we cannot forget about restoring the air as well. This is when we place an air scrubber. This piece of equipment works by passing the air inside a room through three filters to remove contaminants and small particles. During a water damage, especially one with a lot of demolition needed, we will install an air scrubber. As we are removing the structure items pieces of the drywall, flooring and insulation can float into the air. In this situation, an air scrubber can be installed to keep these particles to a minimum and return the affected area to its preloss condition more quickly. 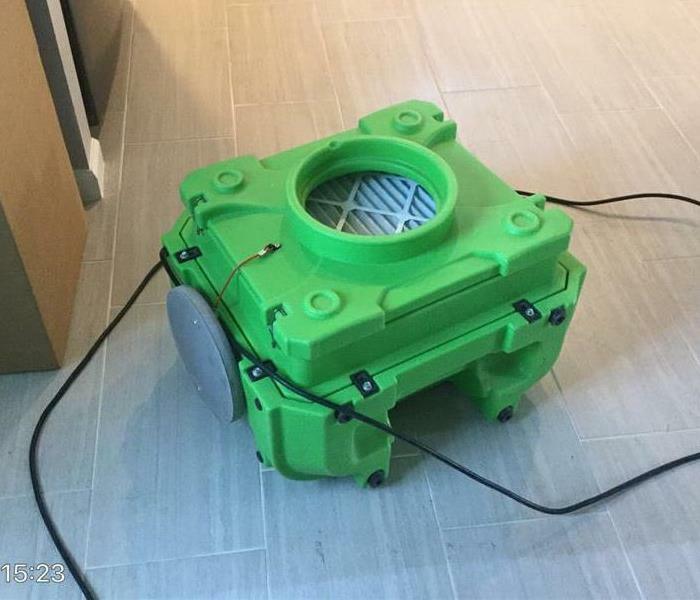 Air scrubbers are essential in situations where damage has been caused by sewage or a sewer line back up, to help remove left over contaminants from the air. We use air scrubbers to make sure that as we are decontaminating the surfaces, the air isn’t retaining any particulates that could leave behind germs or odors. While restoring an area that has been affected by mold, we will also place air scrubbers. Mold spores are always present in the air, because we open our doors and windows. Air scrubbers are important because while working on a loss with visible mold growth, a higher mold spore count is also present in the air. As such, while we work to remove the visible mold from the structure materials and prevent additional growth, we also remove these spores from the air by having the air scrubbers running. Overall, an air scrubber assists in the restoration process and provides a cleaner, healthier environment in an area affected by a disaster. Which restoration company should I choose? Always learning more so we are able to make it "Like it never even happened." SERVPRO of Woodbridge/Lorton is happy to say that we are a Certified Firm with the Institute of Inspection Cleaning and Restoration Certification, also known as the IICRC. The IICRC is a non-profit organization that has been setting the bar for restoration industry standards for years. What does the IICRC do? In order to obtain a restoration and mitigation certificate, technicians must prove knowledge of standard practices and procedures. They cannot receive certification without first attending and completing approved coursework through an approved school and instructor. The IICRC also requires training in the latest restoration technologies and techniques through a certified firm. The field of mitigation and restoration is a highly specialized field, and you should make sure that everyone involved in your project is a trained and specialized technician working under a certified firm. Ensuring that everyone is qualified means that you can rest assured that your residence is in good hands under the supervision of a team that has met some of the highest standards in the industry. Becoming a certified disaster restoration specialist in the Dale City area is not a one and done kind of process. Both firms and agents must maintain their certifications through continuing education and practice. Every certificate has an expiration, and just because someone was once certified and capable does not mean that they still are. Standards of care change frequently as advances in technology and techniques evolve, and it is essential that you hire a firm that is capable of performing at the standards of today, not yesterday. We are proud to say that we have members on our time that are Master Water Restorer’s and several Journeymen on their way to getting that Master designation. Our team has participated in numerous IICRC classes to include Health & Safety, Water Damage Restoration, Applied Structural Drying, Odor Control, Fire & Smoke Restoration, Applied Microbial Remediation, Carpet Repair and Carpet Cleaning. The IICRC & SERVPRO of Woodbridge/Lorton take great pride in their certified technicians. These individuals have proven their knowledge and ability, and because of that, they have earned the respect of an industry standard setter. Therefore, the next time you are faced with a disaster and the impending work of a restoration, seek out only those professionals and companies that proudly proclaim their certification. You can check to see if a firm is certified by going to IICRC website. With any disaster, cleanup can be a hassle in the Northern Virginia area. The mess left by flash floods, structure fires, or a leak you did not know about that caused mold is a lot to handle by yourself. At SERVPRO of Woodbridge/Lorton, we provide emergency cleaning services for any of these problems. Let us help you get your life back to normal after an emergency, as quickly as possible. Sometimes the most damaging thing from a fire is the soot left behind and the water that comes with putting out the fire. Our cleaning professionals will remove any traces of water and odor left by smoke and soot after a fire. The same is true when it comes to removing mold, mildew, and sewage. With our trusted professionals, you can be sure the damage from any disaster will be minimized as much as possible. Immense water damage, like a flood from a burst pipe, always happens when you least expect it. Our emergency restoration services are available 24/7 because these emergencies cannot wait. Immediate action must be taken in order to save your home or business. Our trusted team will respond quickly to clean up the mess and lower the possibility of mold growth. Fires are destructive, as well as the smoke and soot that comes with them. If these problems aren’t taken care of very quickly, the damage will be severe and permanent. Take action instantly after a fire and call our restoration team. We can fix all of the problems that come after a fire, and we do our best work to return your home or business to normal. Mold grows when water damage has not been dried properly. If you have had previous water damage and are now seeing fuzzy or wet spots of mold somewhere in your home, call us today. The quicker a mold problem is taken care of by our professional restoration team, the less overall damage you will have to deal with. Cleaning services from SERVPRO of Woodbridge/Lorton will take care of these messes so you don’t have to! We are available 24/7 to help with any emergency, at any time. Contact us today, and our professional cleaning services will take care of any emergencies you have. Whether its mold, water, or fire damage, our team at SERVPRO of Woodbridge/Lorton has the most reliable emergency restoration services. We are available any time, day or night, to help with any problem, and you can trust us to do our best work every time. No matter what emergency you’re facing, contact SERVPRO of Woodbridge/Lorton today at (703) 494-7100 and let our emergency restoration services team take care of it! We take pride in our Brand! CONGRATULATIONS to our whole team!!! 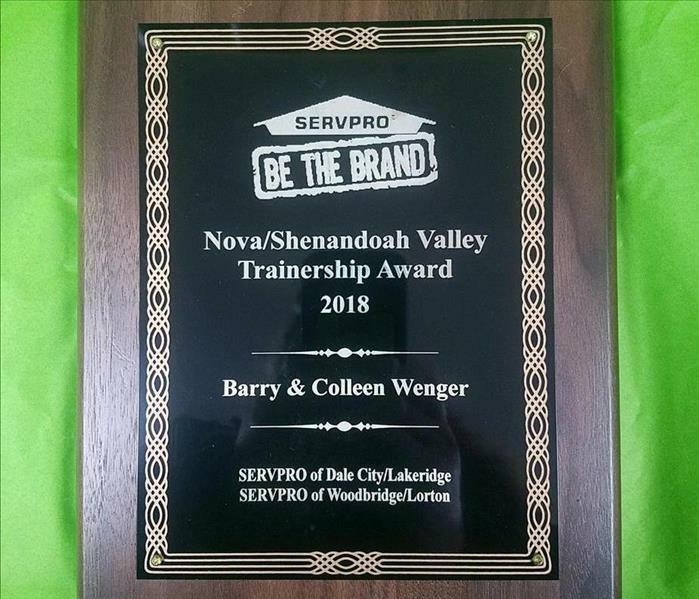 For the FIFTH year in a row, our franchises have won the BE THE BRAND AWARD out of all the Northern Virginia and Shenandoah Valley franchises. This does not mean that we are the biggest SERVPRO; it means that out of all the Franchises in our region, SERVPRO Corporate feels that we best represent the SERVPRO BRAND!!! Our Owners feel this award is due to the loyalty, dedication, hard work, sweat, long hours and heart of every employee on this team, many of whom have been with us from the very beginning. We are humbled and thankful for all of you! Thank you so much! We love you! You can see what our past customers have to say about the crews that come to their home by visiting our testimonials on our website. A routine part of SERVPRO of Woodbridge/Lorton is inspecting the heating, ventilation and air conditioning unit (HVAC). Keeping the HVAC and ductwork clean can potentially extend the life span of the equipment by allowing it to operate at peak condition, which may save you money. In some circumstances, such as after fire, smoke or suspected mold growth, duct cleaning becomes an essential part of the cleanup process. The SERVPRO Duct Cleaning System is proven and cost efficient. Unlike the majority of duct cleaning services, SERVPRO of Woodbridge/Lorton uses a portable ventilation and air duct cleaning system to examine ductwork and make a clean sweep, removing years of duct and grime. For more information on duct cleaning, or to schedule an appointment contact our office at 703-494-7100. Recognized as a leading fire and water cleanup and restoration provider by hundreds of insurance companies, SERVPRO® Woodbridge/Lorton Professionals also offer fast, reliable biohazard and crime scene cleanup* and restoration services to residential and commercial property owners. Exposure to biological and chemical contaminants can pose serious health consequences for building occupants, employees, customers, and owners. A failure to properly handle and safely remove such hazardous substances can contribute to unhealthy and even dangerous environments. Your local SERVPRO® Woodbridge/Lorton Professionals are trained to safely and effectively remove biohazardous substances and prepare waste for proper disposal according to OSHA, EPA, and state and local health regulations. Equipped with the necessary safety equipment and cleaning products, SERVPRO® Woodbridge/Lorton Professionals help turn unsafe environments into clean, safe homes and offices. 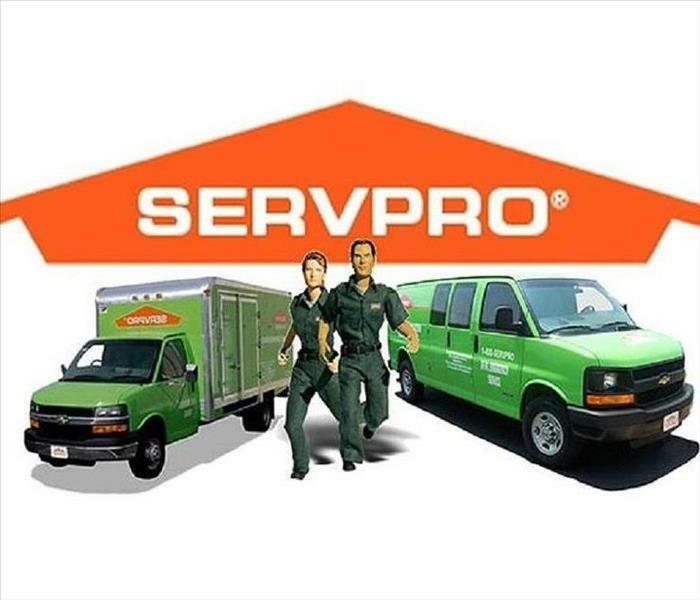 SERVPRO® Woodbridge/Lorton Professionals can help with the following issues: Blood borne Pathogens, Methamphetamine Labs, Crime Scene Residues, Arson n Vandalism, Sewage Backups, Black Water Intrusions, Mold Mitigation and Remediation State and local regulations vary. BLOODBORNE PATHOGENS: SERVPRO® Woodbridge/Lorton remove and dispose of bodily fluids, tissue, and other potentially pathogenic substances resulting from accident, trauma, crime, or death. Trained SERVPRO® Technicians thoroughly clean, disinfect, and deodorize the structure. METHAMPHETAMINE LABS: Many of the chemicals used in the production of illegal drugs, such as methamphetamine, are volatile and can leave harmful residues throughout a structure. SERVPRO® Woodbridge/Lorton follow federal and state guidelines to properly clean all surfaces. CRIME SCENE RESIDUES: From fingerprint powder and evidence gathering chemicals to tear gas and pepper spray residues, SERVPRO® Woodbridge/Lorton can clean and restore your property and contents. ARSON AND VANDALISM: SERVPRO® of Woodbridge/Lorton are recognized as leaders at helping property owners recover quickly from fire and water damage. We also provides general cleaning and deodorization services for situations resulting from vandalism including graffiti, egg, spoiled foods, and human or animal waste. Contact SERVPRO® of Woodbridge/Lorton Professional at 703-494-7100 today for 24-hour emergency service. Pretty lights, candles and decorations are just a few of the items bringing charm and cheer to the holiday season— however, if they are not used carefully your holidays may go from festive to frightening. The American Red Cross offers the following safety tips to help greatly reduce the fire risk in your home or business this holiday season. Make sure light strings and other holiday decorations are in good condition. Do not use anything with frayed electrical cords and always follow the manufacturer’s instructions. Keep anything that can catch fire—pot holders, oven mitts, wooden utensils, paper or plastic bags, food packaging and towels or curtains—away from your stove top. Designate one person to walk around your property to ensure all candles and smoking materials are properly extinguished after guests leave. Your local SERVPRO® of Woodbridge/Lorton Professionals wish you a safe and happy holiday season! Check your business property for downed tree limbs and branches. Wind, heavy rain, ice and snow can cause branches to fall, which could cause damage to the property and potentially cause personal injuries. Roofs, water pipes, and gutters should all be inspected to help ensure they are in proper order. Gutter downspouts should be directed away from your building. Clear gutters of debris that may have gathered during the fall. Leaves and other obstructions can cause a damming effect, which can lead to roof damage and interior water problems. Inspect property, especially walkways and parking lots, for proper drainage to alleviate a potential flood hazard. Ask your local SERVPRO® of Woodbridge/Lorton Professionals about completing an Emergency READY Profile® (ERP) for your business. The ERP is a no-cost assessment of your facility and provides you with a plan to get back in business faster following a disaster. When winter weather strikes, call your local SERVPRO® at 703-494-7100 to strike back. This time of year is when families gather to celebrate Thanksgiving by preparing a delicious feast for all to share. We just want to warn you that if you don’t practice safe cooking habits, your happy holiday could become hazardous very quickly. According to the National Fire Protection Association, cooking is the main cause for home fires and injuries, with Thanksgiving being the peak day for cooking-related fires. Do not wear loose clothing or dangling sleeves while cooking. n Clean cooking surfaces on a regular basis to prevent grease buildup. Purchase a fire extinguisher to keep in the kitchen. 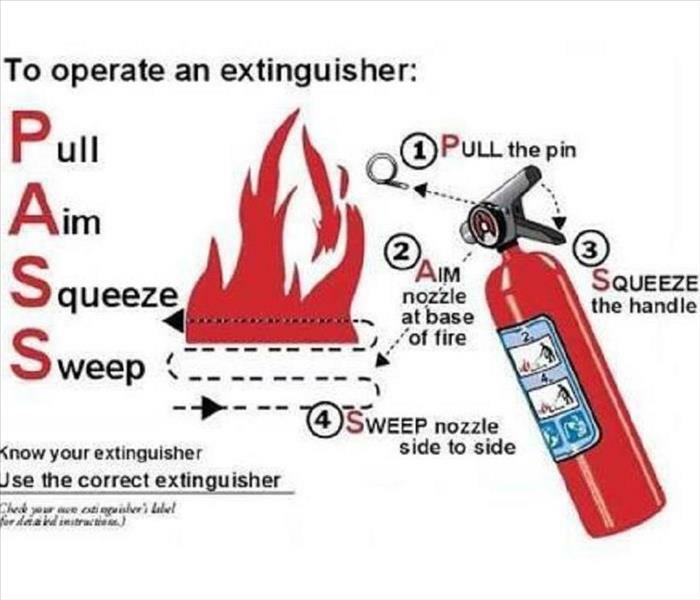 Contact the local fire department for training on the proper use of extinguishers. All of us here at SERVPRO® of Woodbridge/Lorton wish you and your family a safe and happy holiday season. .. Pull the pin. This will also break the tamper seal. .. Aim low, pointing the extinguishernozzle (or its horn or hose) at the base of the fire. .. Squeeze the handle to release the extinguishingagent. .. Sweep from side to side at the base of the fire until it appears to be out. Do you know what Class fire extinguisher you should have? Class A: This is the most common extinguisher and can be used to put out fires in ordinary combustibles such as cloth, wood, rubber, paper and many plastics. Class B: Used on fires involving flammable liquids, such as grease, gasoline and oil. Class C: Designed for fires involving appliances, tools, or other equipment electrically energized or plugged in. Class D: For use on flammable metals; often specific for the type of metal in question. These are typically found only in factories working with these metals. Class K: Intended for use on fires that involve vegetable oils, animal oils, or fats in cooking appliances. These extinguishers are generally found in commercial kitchens, but are becoming more popular in the residential market for use in kitchens. 3/22/2019 - Which restoration company should I choose? 11/30/2018 - Are your ducts in order? 11/30/2018 - Are you Winter ready? 11/8/2018 - Fire Extinguisher Safety!